The 1987 Italian Grand Prix was a Formula One motor race held at Monza on 6 September 1987. It was the eleventh race of the 1987 FIA Formula One World Championship. It was the 57th Italian Grand Prix and the 52nd to be held at Monza. The race was held over 50 laps of the 5.8-kilometre (3.6 mi) circuit for a race distance of 290 kilometres (180 mi). The race was won from pole position by Brazilian driver Nelson Piquet, driving a Williams-Honda. Piquet took his third victory of the season by 1.8 seconds from compatriot Ayrton Senna, who led in his Lotus-Honda before running wide at the Parabolica with eight laps to go. Piquet's British team-mate, Nigel Mansell, finished third, nearly 50 seconds adrift. It was also the sixth consecutive victory for the Williams team, a run of wins that had begun at the French Grand Prix in early July. French Tyrrell DG016 driver Philippe Streiff was the first naturally aspirated Jim Clark Trophy car to finish in 12th, three laps down on Piquet. The win strengthened Piquet's championship points lead to 14 points over Senna and 20 over Mansell. During qualifying, Piquet recorded a speed of 352.135 km/h (218.807 mph), the fastest achieved by a Formula One car during the first turbo era of the sport (1977-88). Due to the entries of AGS and Coloni, for the first time in the 1987 season, there would be drivers who would fail to qualify for the race - in this case, it was to be Nicola Larini in the Coloni and Pascal Fabre in the AGS. Numbers in brackets refer to positions of normally aspirated entrants competing for the Jim Clark Trophy. ^ "Motor Racing Programme Covers: 1987". The Programme Covers Project. Retrieved 10 November 2017. ^ "1987 Italian Grand Prix - QUALIFYING 1". formula1.com. Retrieved 5 May 2018. ^ "1987 Italian Grand Prix - QUALIFYING 2". formula1.com. Retrieved 5 May 2018. 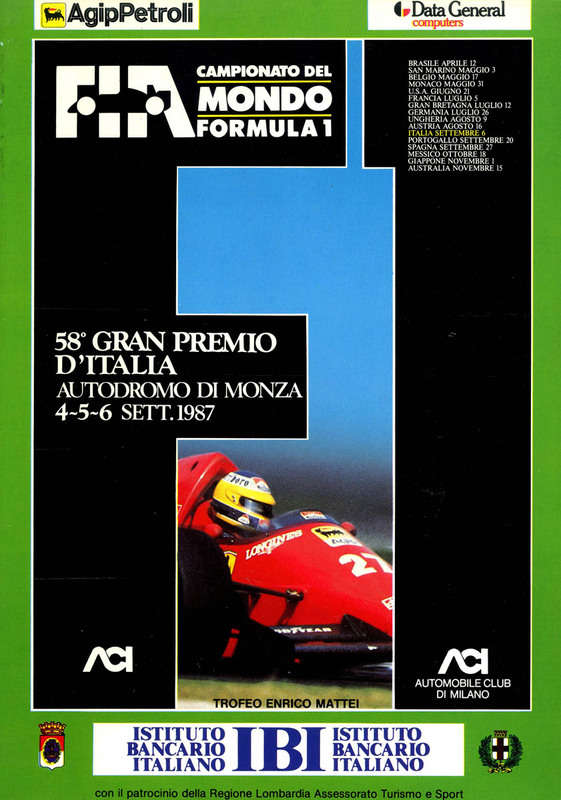 ^ "1987 Italian Grand Prix - OVERALL QUALIFYING". formula1.com. Retrieved 5 May 2018. ^ "1987 Italian Grand Prix". formula1.com. Archived from the original on 3 November 2014. Retrieved 23 December 2015. ^ a b "Italy 1987 - Championship • STATS F1". www.statsf1.com. Retrieved 18 March 2019. This page was last edited on 18 March 2019, at 16:42 (UTC).